Offers Auto Repair Services You Can Count On! Fred’s Auto Center has provided comprehensive auto repair services to West Haven, CT and vicinity since 1996. Fred’s affordable pricing belies the expert service they provide. From brake to transmission repair you can count on us for all of your car repair needs. The technicians at Fred’s Auto Center will get you back on the road in no time. Our auto mechanics are experts! We have years of experience working on domestic and import vehicles from all makes and models. You will not find a better place to bring your car for major or simple repairs. I’m a auto part driver .. I deliver to that garage all the time they are a great garage to get your car fix at. Very pleasant and quick turn around. Not expensive either. Recommend them to all. I have a new auto center now that I’ve been there twice. Excellent! Always courteous and helpful. 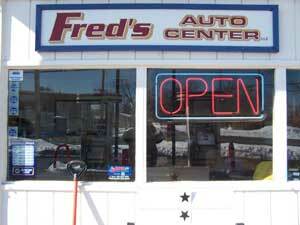 All 6 of our cars are serviced at Fred’s and his work is outstanding.